The early days when the bus first arrived on island! WELCOME TO THE BUS BLOG! Welcome to The Simple Bus Life Blog! This is our first blog post and we are so excited to share with all of you the story of designing and building our home in the Caribbean. We are the Trattner's Amanda, Joe and our beloved Pitbull Maho and we live in St. Thomas in the US Virgin Islands. For the past 2 years we've been working on creating our dream property which includes our tiny school bus home, a modern shed structure (that Amanda likes to refer to as the barn), and the landscaping / hardscaping of our property. For us and our soon to be growing family (surprise we are expecting our first child in November of 2016, stay tuned for "Bus Baby" updates) less is truly more. We began this crazy, cool, fun journey by purchasing a 1968 Crown Super Coach bus from the Chicago area. We drove the bus from Chicago to Jacksonville Flordia and then shipped it over to St. Thomas on a barge in October of 2014. The bus arrived on island in November of 2014 although we were not able to begin work on the bus until after the holidays. Demo and construction of our bus home began in January of 2015 and in February of 2015 we purchased a half acre of land on the Northside of St. Thomas overlooking Magen's Bay. We spent the next 5 months finishing the construction of our bus, while still managing to keep both of our businesses a float. In July of 2015 we spent the first night on the One Love Bus, the home that we built ourselves and know every nook and crany of! That first night on the bus was the most amazing feeling in the whole world! We'll never forget it. We are about to come up on the 1 year anniversary of living in our bus home and we coudn't be happier with how everything came out and are so excited to share with you all the project! We are new to blogging and Instagram but we are loving the interest that people have in our project and are loving connecting with like-minded people. We will be posting updates and blog posts on the various building, design, and living practices that have gone into creating our "Simple Bus Life." We lovingly refer to our property as Valhalla. Our view looks out over beautiful Magen's Bay in St. Thomas. Here we feel connected to nature and at peace. We enjoy having picnics in our yard, and fires at night. The star gazing is amazing too! We laid the sod ourselves and planted it into the hillside to make natural benches and chairs for when we lay in the yard. We've been told it has a "Lord of the Rings" feel. Often times we will bring out blankets and bohemian poofs to sit on. We love tobe able to feel the earth beneath us and the grass between our toes and (grass is very rare in the Caribbean so this is a special touch to our yard). The stone work was done by Amanda's brother, Barkley Kenton who landscaping business in the New England area. We absolutely love how our quirky pathway and yard came out!! Behind the bus, you will notice our Modern Shed. 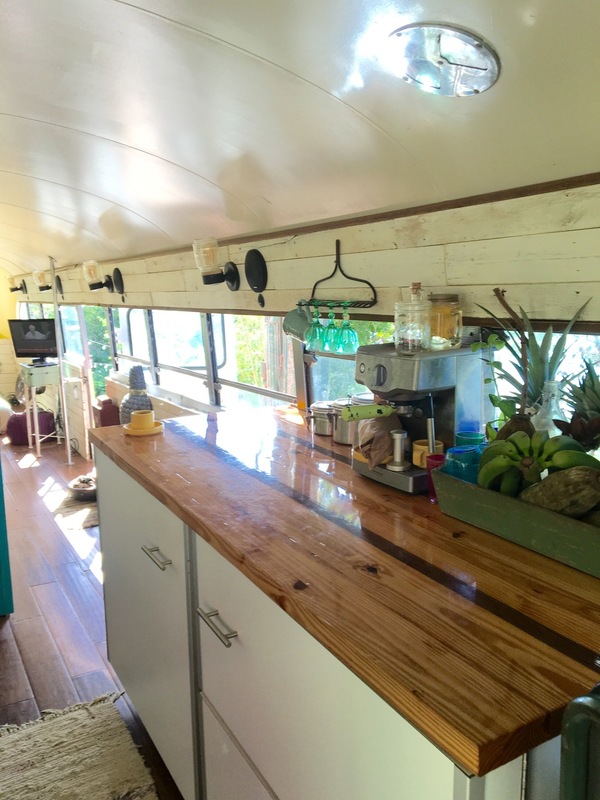 This is the One Love Bus kitchen looking back towards the living room and bedroom area. This is actually the most efficient and functional kitchen we have ever cooked in! We both love to cook and we fit together in the kitchen space perfectly fine. We have an Ikea farm sink that has come in very handy to give the dog a quick rinse and will also work to bath children someday (bath tubs are nearly nonexistent in the Caribbean because we have to conserve water). Next to the sink is a full-size dishwasher and stove by the GE Artistry Line. We love the retro look of the appliances from this line. They were also very reasonable to buy. To the right is our custom energy efficient frige and freezer. The fridge is made by a company called Sun Frost and only requires a few hours of sunlight a day to opperate. The custom made countertops and cabinents were made by Joe and Dan from Meat & Potatoes carpentry in St. Thomas. Across from our farm sink and stove is our energy efficient fridge and Freezer by Sun Frost. We were able to custom design this piece and opted for an under the counter design in order to keep clean site lines throughout the bus. You will notice in these pictures that we did not cover up any windows in our bus and that we do not use window coverings, we love to be close to our natural surroundings. The countertops of our bus are custom made butcher blocks. Joe and Dan made these and designed them to look like retro surfboards. Our wine glasses hang from a rake that broke during our initial bush cutting. This is a great way to repurpose a broken rake! Our espresso machine is more or less for "looks." Now that we live off the grid we make espresso daily with our Aero Press. This is hands down the best cup of coffee we've ever been able to make at home and the best thing is it does not require any electricity! We love to buy local and always keep locally farmed fruit and vegetables on hand. Nothing beats fresh tropical fruit to go with your coffee in the morning! The cabinets were custom made by Dan From Meat & Potatoes Carpentry. Joe was Dan's apprentice on this one. After the boys completed the cabinets they sprayed them with turquoise paint and my sister and I distressed them to give them a vintage, modern, bohemian look. 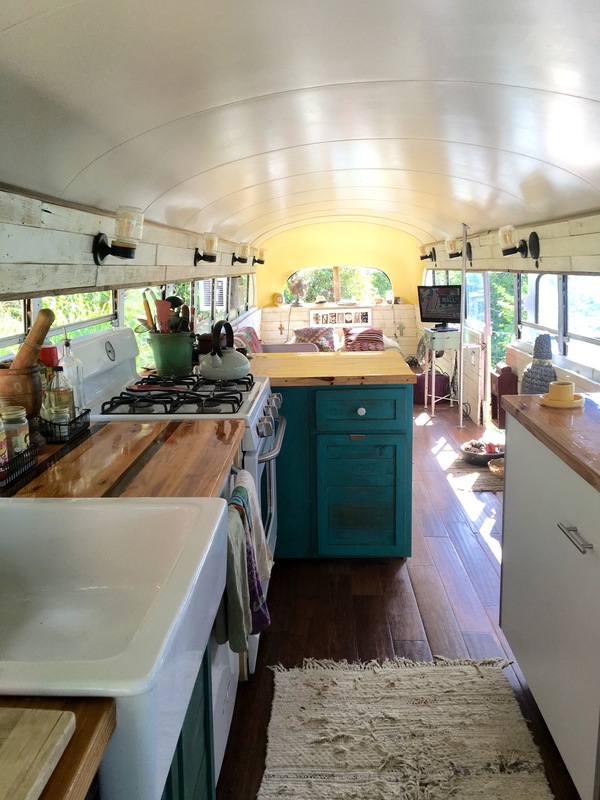 From the kitchen side of the bus, we use the island counter as a meal prep space. We often eat from the island counter and use it as our desk working space. We purchased the sconces for the bus from Home Depot. We customized them with wood and LED edison bulbs that are very energy efficent. We have a dimmer on them too. (Joe is a light aficionado so the bus lighting has to be perfect). Looking back towards the kitchen you can see our "home office" and living room space. When we both work from home or when we dine Joe will scoot the garbage can up to the counter to sit on. This multipurpose garbage can / seat has come in very handy. The storage ottoman is a handmade piece from Dot and Bo by a furniture company in Chicago. Amanda often works from this space. In addition to looking great the ottoman also duals as the pantry overflow. The food pantry is located right in front of the ottoman. To the right of the pantry are shelves that store our business supplies. We added wheels to the bottom of the ottoman legs and in the evening hours usually push it over to the couch to kick our feet up on. This is where all the magic happens of course ;) The walls of the bus are made from shipping pallets. Amanda took on the job of being the designated pallet crusher for the project and spent many hours prepping these bad boys. Pallets are really the only form of reclaimed wood that we have in the USVI and we have an abundance of them becasue they are not shipped back to the mainland. After ripping the pallets apart, along with the help of some friends we pounded out the nails (because they would rust through the paint), painted them in white and then sanded them down to give them a rustic beachy look. We painted our walls in a "creamy white" and ceiling in a "canvas" color. We added a few pops of color to define certain spaces of the bus. The bedroom is "June day yellow," front entry off the kitchen is a "retro green" and the side door (which acts more like our front door) is painted in an "antique red." Joe thinks that all doors should be red ;) All of our paint was purchased from Sherwin Williams. This picture is our living room, looking back towards our bedroom. Our flooring is engineered bamboo. We chose bamboo because it is a renewable and eco-friendly material. The flooring was special ordered through Home Depot on St. Thomas. The floors have a distressed look which we love because we are super laid back, dog loving kind of people. We describe our style as "vintage, modern, bohemian." This is such an easy look to pull off and one that we highly recommend. You really can't screw up! All colors, textures, and patterns go and nothing has to be perfect. Since there really aren't any antique stores or places to buy reclaimed pieces on St. Thomas, we relied on mostly online shopping for this. We found the website www.dotandbo.com and fell in love with them (all except for the fact that they don't actually ship to the US Virgin Islands, so we had to send everything to Joe's mom, who then forwarded it on to us). Thanks, Deb! We still owe her fortune in shipping costs. Hopefully someday soon they will add the USVI to their shipping destinations. After seeing the pictures of the bus you are probably wondering where our bathroom is? We opted to keep the clean sight lines and space for other uses on the bus and built a modern shed structure, which acts as a multipurpose space for our "bath house," dressing area, or "walk out closet," (as we like to call it) and storage space for Joe's ever growing collection of tools ;). This has worked out very well for us! We built the shed structure on footers so that we didn't have to disturb the land. In the Virgin Islands we collect rain water with cisterns. The canteleaver roof of the shed structure helps with rain water collection. Behind the shed we have two above ground cisterns that we purchased from Home Depot (1000 gallons). The space on the bus has been more than enough room for 2 humans and a super cool Pitbull, and we are confident that we will be able to welcome baby Trattner to bus life just fine as many other tiny home families have. 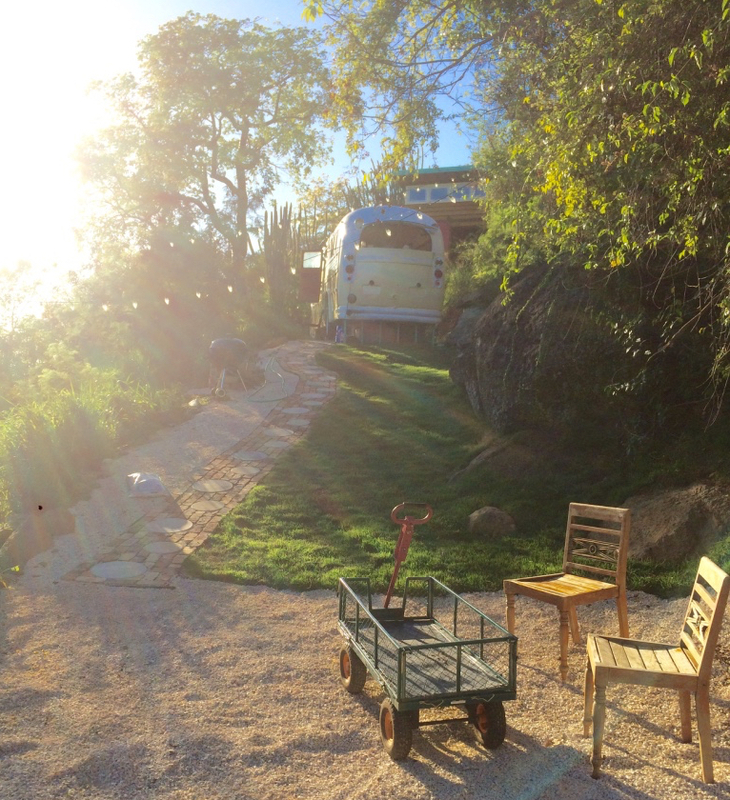 In planning out the vision of our bus / property we knew that for us the key to tiny house living would be to have comfortable outdoor spaces to hang out and play in. Our climate in the Caribbean is also Ideal for this! Throughout our blog, we hope to ignite a global passion for sustainability and self-reliance and inspire others to live a smaller and more simple life. If you aren't ready to take the plunge and go completely tiny, there are still so many advantages to downsizing and leaving a smaller footprint on the earth. This day and age the new American Dream is "less is more." If you agree with this statement please "Like our Facebook Page" follow us on Instagram and send us comments and come along with us for the ride!